So here we are, at the last of our end of year reviews. 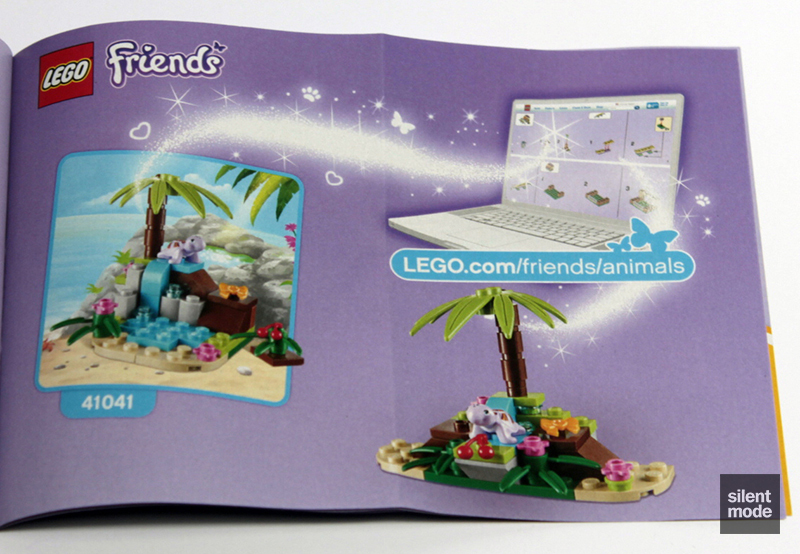 From the Friends Collectible Animals Series 4 (or whatever the theme is called), we’ve saved the turtle for last, and you may remember there being a green turtle in the first series (Turtle’s Little Oasis). So what has changed? If you compare the packaging to Turtle’s Little Oasis, you’ll notice the choices of colour have been toned down (and not just because of my Photoshopping); there aren’t any Yellow elements in sight. 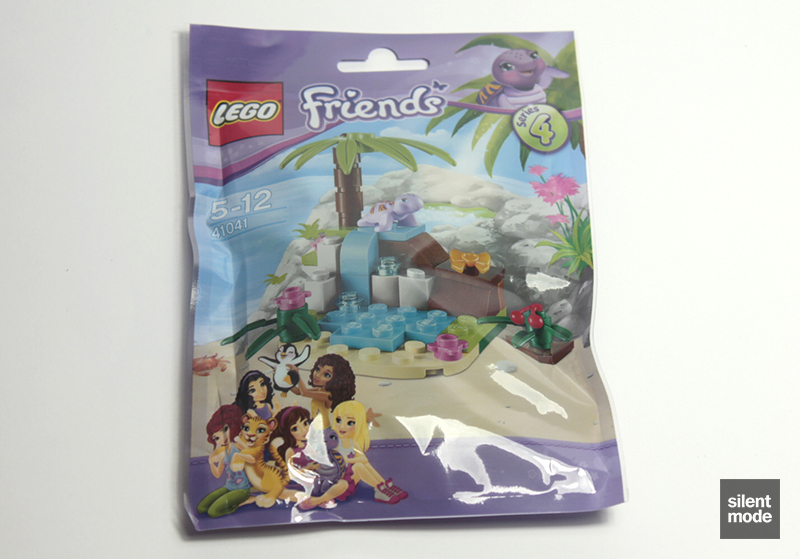 Once again, the alternate build for this set graces the back of the packaging, along with however many warnings in varying languages. Even more noticeable this time around are the little sparkles around the model. Decidedly less… flamboyant than the other two (despite being purple! 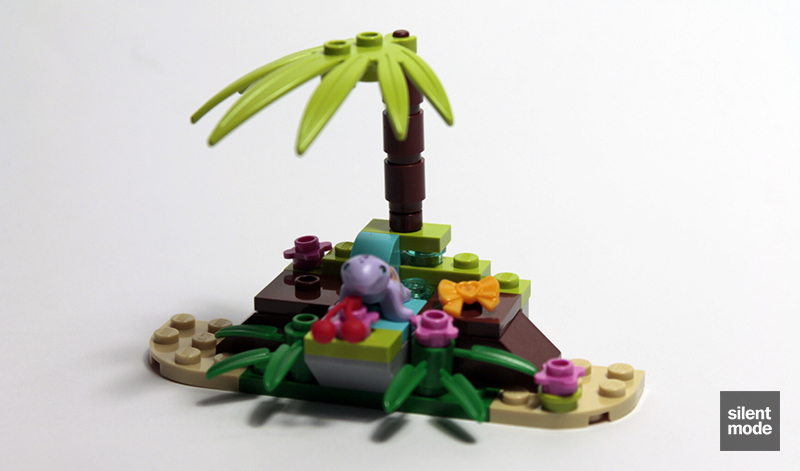 ), the turtle strikes a pose on the instructions, accompanying the bag of parts. There seems to be a wider range of colours than in the other two sets. Immediately jumping out at you is the large leaf part in Lime. It’s called a swordleaf, according to one of the buying sites, and this particular mould appears in six sets at the moment: you may recognise them from early Legends of Chima sets. While the other parts look fairly pedestrian, pay particular attention to the Reddish Brown flat-top antenna, which is a very uncommon part (only appearing in Heroica’s Draida Bay and Glove World from the Spongebob Squarepants theme). The Medium Azure 1×2 plate is currently exclusive to this set (and there’s only one! 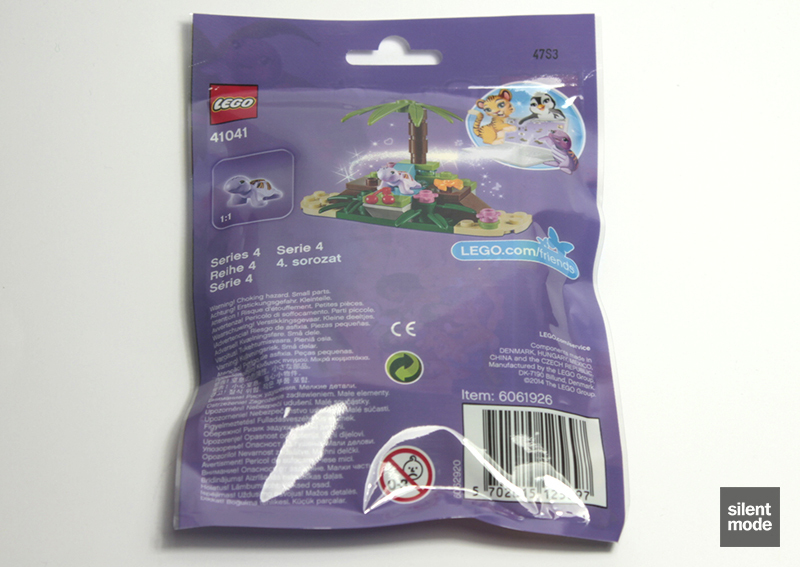 ), while the curved brick in the same colour will also make an appearance in set 41051, which is one of those Disney Princesses sets for next year. This set is now also the least expensive to find the Dark Orange 1×2 palisade bricks. A particular shock this time around is the presence of Bright Light Orange bows instead of Medium Azure. These are currently exclusive to this set – but more importantly what does it signify? Well, here’s the turtle… You can see it’s in the relatively new Lavender colour introduced by Friends, and has a more distinctive shell design than the first. Unlike the picture on the instructions, the turtle doesn’t appear to have eyelashes. 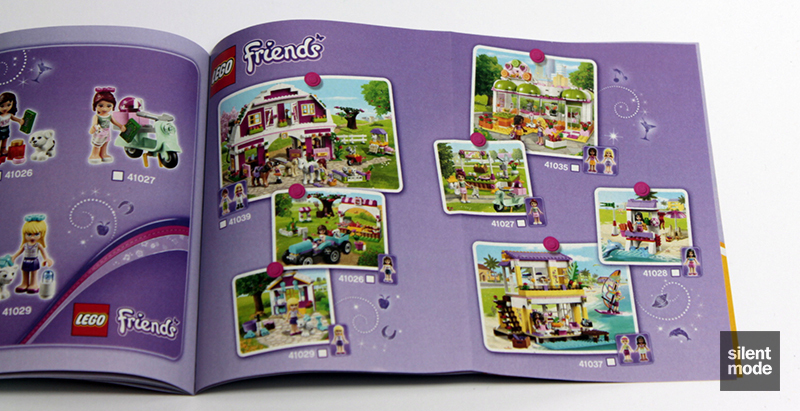 Until LEGO posts an official description on their site, that can only mean one thing: it’s androgynous. The ribbon of androgyny is placed on the turtle’s head, and its food of choice appears to be… berries. Plates of different colours and sizes fit together to make the base of this small island. This isn’t too difficult, but keep an eye out for where those non-plate parts go once the base is assembled. More little details, including a tiny waterfall, are gradually added. It’s starting to look like a microscale build! The last part of the build involves making a palm tree out of the remaining parts: the 1×1 round bricks slide over the antenna, which is ended with the swordleaf. In no time at all the build is complete, and turtle takes its rightful place on top of the hill. Again, five parts! Another Bright Light Orange ribbon for androgynous animals, and a cherry may interest you, but for me this is the least interesting set of leftovers. Not even the 1×1 flower plate can change my mind. A very tricky build to accomplish without instructions: the challenge is figuring out which bits form the base. I managed it in the end, as you can see. One thing they’ve done which I don’t like is placing the bow inside the stud of a 2×2 jumper plate, which is as loose a connection as one can get. The seven Friends sets in the fifth wave are presented as a cheeky checklist. Can you [convince your parents to] buy them all? Before the next ones come out? I don’t remember being incredibly thrilled with the turtle from Turtle’s Little Oasis, and even though the same mould is used for a turtle in Lavender, I’m still not impressed. It’s a nice to have animal, I suppose. The build, on the other hand, is very impressive. 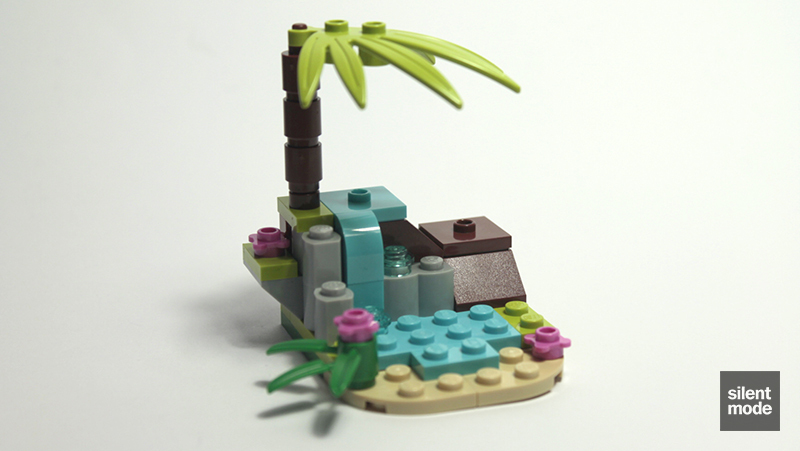 Being a fan of microscale builds (and I’m not saying that just because of the review), I like the level of detail conveyed in the main build, particularly with the waterfall. It could just as easily be a microscale scene. In terms of the parts, while there are some exclusives and a pinch of very useful ones, I wouldn’t go breaking any walls down to get hold of this set – particularly as they’re in such small quantities. It’s definitely recommended to get hold of one to complete the collection, however. This is the one case of the main build outshining the featured animal (IMO at least), although they did what they could with the turtle. Possibly the most challenging build of the three, with the alternative build posing the most difficulty without instructions. 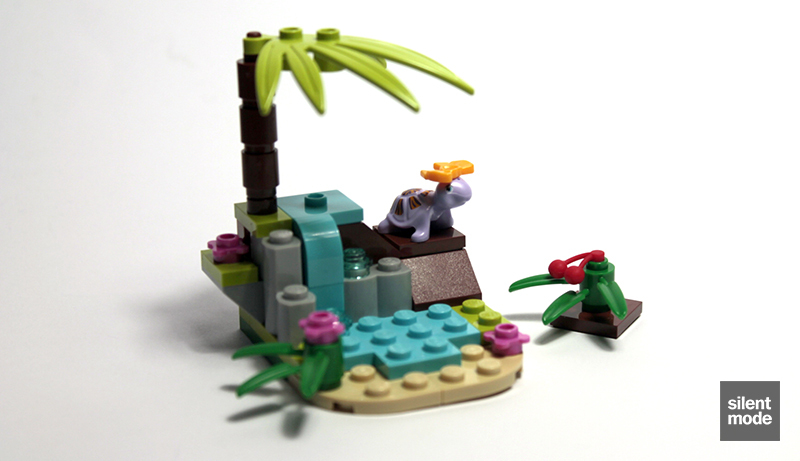 All of the parts can easily be used to create landscape features and incorporate into your own MOCs, but the more lucrative parts are in ones and twos. As much of a display piece rather than something to play with as Tiger's Beautiful Temple - it lends itself to being part of a larger display, perhaps in a zoo. Once is okay for completing the collection, though I'm not sure if I'd go out and get (or even take!) more than one of this set. So at the end of 2013, the turtle and its habitat gets 7.0/10. Not a bad score at all. That is it in terms of reviews for 2013. We’ll be doing this again next year!